Merle and Eleanor, Keith and Linda Hamilton are the present Owners-Operators of Hamilton Ranch, Incorporated. Merle was born and raised in Bownan, North Dakota, his parents ranched in ND and in the Osage, WY area. Eleanor was born in Basin, Wyoming and she and her son Keith (born in Worland), both grew up on the Walter’s Ranch – which is now the Hamilton Ranch, Inc. Linda is originally from Gordon, Nebraska. She was raised in Merriman, NE on a cattle ranch in the Sandhills country. Since all were raised in an agricultural setting, it is a life-style that they have stuck with and enjoy. Big Horn County has been their home for a good number of years. They like the weather, the people and the wide-open spaces. Of course Ranching/Farming is one of their favorite things to do, but on the side Keith likes to hunt, Linda quilts and has other hobbies. Eleanor participates in church and the community center activities and works at both. Keith and Linda have two children - Diane, 24, and Douglas,22. Douglas plans to take part in the family business after graduating from the University of Wyoming. He already owns a small flock of Rambouillet sheep and sells bucks to Hamilton Ranch and other sheep producers. He owns a small herd of registered Angus and sells bulls & heifers at the Paintrock Angus Annual Source of Force Bull Sale and some private treaty. Diane works for an accounting firm (PMCH) in Casper and owns a small flock of Hampshire sheep. She also sells bucks produced from her herd. She would some day like to own or rent a place where she could raise her sheep. 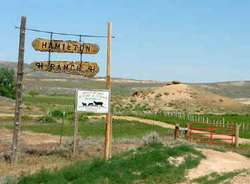 The Hamiltons have been interested in range improvement, water development, water quality and water efficiency and have incorporated quite a few conservation practices into their land/ranch. These include the fairly new rotational grazing and pivot irrigation practices as well as gated pipe, land leveling, stock water development, sage brush control, and timber management on private timber stands. They maintain that these practices have reduced labor costs, improved water quality and quantity, and help them to better utilize available range. The rotational grazing and stock water developments have allowed utilization of range that hadn’t been used for many years because of lack of water. Sage brush control has promoted more available forage for sheep and cattle. Irrigation and crop practices have reduced labor, increased production of alfalfa and small grains, and improved use of available irrigating water. Implementing Neil Kinsey's soil health techniques and performing yearly soil analysis has also improved their land. The Hamiltons feel that producers will be faced with many of the same issues that have been faced in years past and in order to survive we will have to be good managers of our financial and natural resources. Keith and Linda see themselves still playing an active role in the ranch operations in ten years and look forward to only semi-retirement in twenty. Click here to visit the Hamilton's Family History site.